Diode Dynamic LED Dome Light Upgrade for the FRS and BRZ. The Diode Dynamics LED Dome Light Upgrade for your FRS and BRZ. Your dome light, or single light located in the center of the ceiling, uses an incandescent bulb from the factory, giving it a yellowish color. 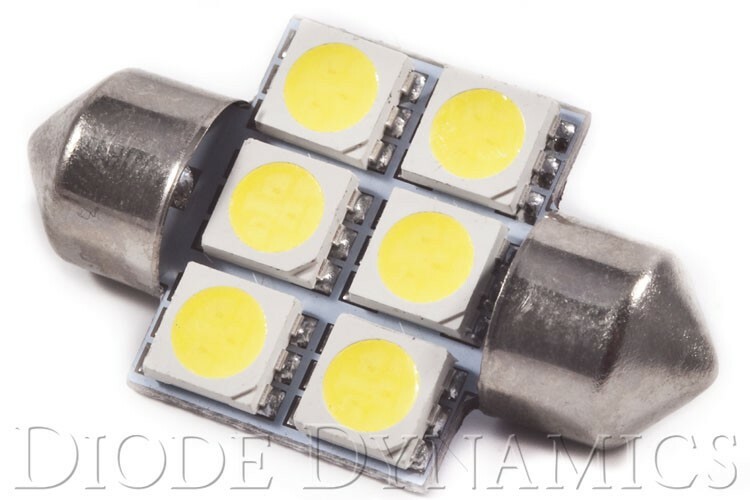 By replacing with an LED, you can add a luxurious and modern look to your vehicle, with a cool white color, just like the lights on newer luxury vehicles. You can also increase the brightness with SMF6 or SMD12 Board, to improve the performance of your dome light. The installation is 100% plug-and-play, just replace your factory bulb! While our bulbs may look the same as others on the market, most copycat bulbs use economy-grade LED chips in order to reduce costs. This greatly reduces the reliability and overall brightness of the bulb when you compare it to Diode Dynamics.